Hello peeps!!! How have you been? I'm back!!! .....and a lot has been going on, all this time while I was AWOL. Researching, curating, creating, photographing and marketing my products for my etsy shop is almost a full time job. And doing all this with another full time job plus managing a household with two kids...ahhhhh...can you imagine???? But it has been an exciting experience, so I'm not complaining. Born and brought up in India, I've been in the US for more than 11 years now. In all this time, my fascination for India- its culture, the history, the textiles and crafts from different states- has only grown. Each visit there, and I come back more enriched. I bring back more....A month or so later, I'm craving to go back and shop again:) Yes, that's me! It all started while I was visiting India last spring. Delhi is my usual stop, but this time I had the fortune to stay in Jaipur for a month. A city I truly love for its culture, beautiful architecture and a multitude of crafts. A glimpse of Jaipur- carved arches at the City Palace! Being an avid fan of block printing and wood blocks, I made a few trips to Sanganer- the mecca for hand block printing (details coming up in part 2). Jaipur is also well known for the finest jewelry makers in the country. And so, exploring the jewelry market was on the top of my list. I scouted the narrow 'galis' of Jaipur's Johri bazaar in search of the most unique finds. One April afternoon, I stumbled upon this tiny little shop tucked away in a narrow alley. As I entered, under the glass counter, I saw neatly lined steel bowls heaped with a variety of the most eye catching beads. These bright colored beads were made using traditional jewelry making techniques such as Meenakari, Jadau and Pachhi work. As I admired these beauties in the palm of my hand, I knew I had to bring them home with me. That's when the idea for an etsy store popped up in my head. The more I thought about it, the more exciting it was. 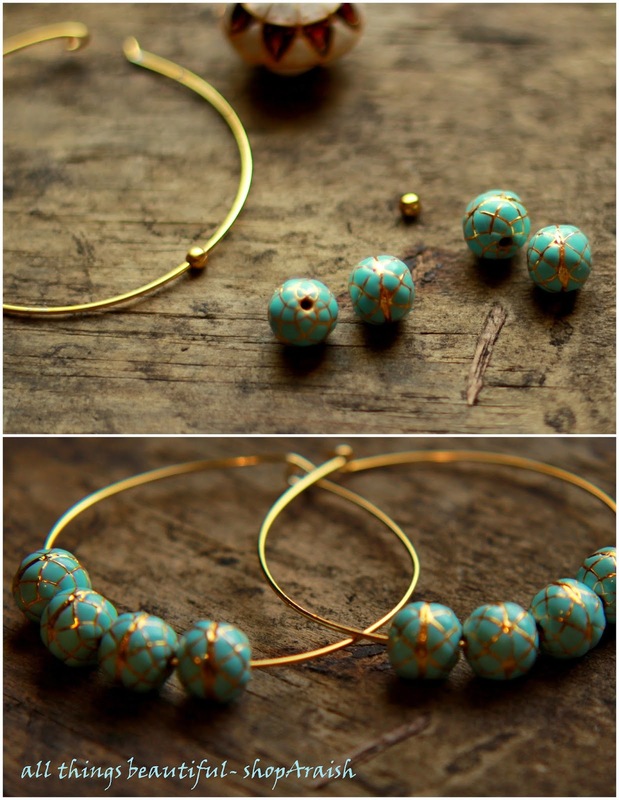 What better reason to shop for these gorgeous finds than to create jewelry out of these and sell them in my own shop. If it was only for myself, how much could I shop. First step was to pick out the best beads and make my designs with them. Next steps.....deciding a name for the shop, lining of products, understanding how etsy works- in short, a lot of work. It all happened, but slowly. I started the shop in August last year, and since then we (me and the shop) have come a long way (I think!). 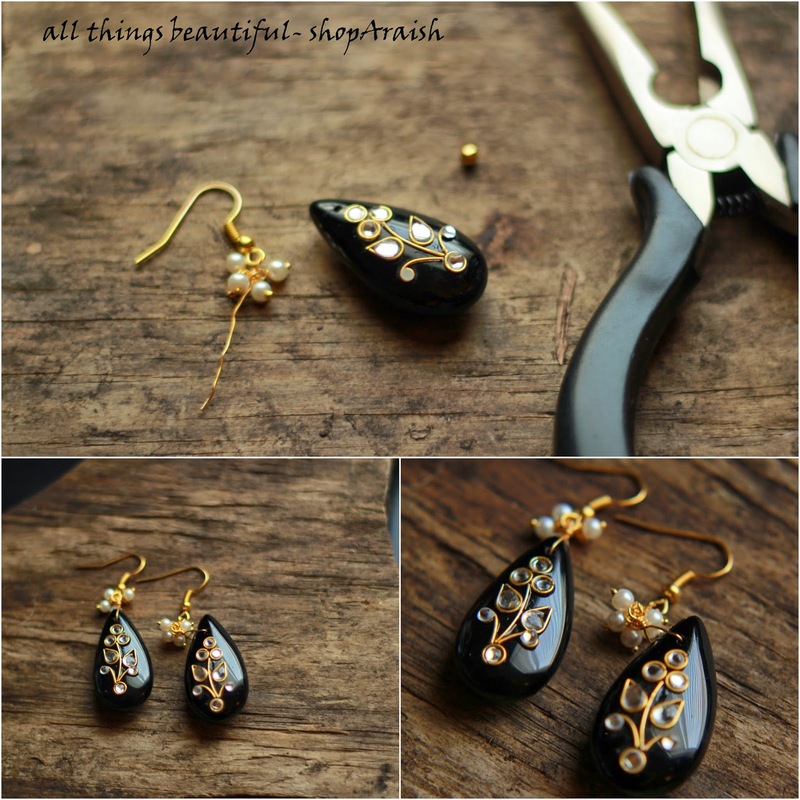 To begin with, I started with jewelry (earrings!). I have recently added a home decor section to the shop. More details coming soon....stay tuned for part 2! Wishing all of you a very happy, healthy, successful, cheerful and joyous 2014!!! Image: Mine. Please do not copy. Is it really the last day of 2013? Its so hard to believe that the year has come to an end. Where did this year go...? Reflecting back at the year..... it has been an eventful year for me for many reasons....but most importantly for one- for a new beginning- My Etsy shop 'shopAraish'. This venture had been in the making for years....only in my mind. With a great load of effort behind the scenes, it finally came to life in the second half of 2013. I'm immensely grateful to God for making this happen...and to all of my family- here at home and also back in India-for their huge support. My daughter was born in 2012, but as she grew up, 2013 saw my family transition from a family of three to a family of four in the true sense....and that, to me, has been a real joy. As I was taking a break from my work this year, I took a long vacation in India and spent some quality time with my family there. I'm so glad I was able to do it. I have a lot to be grateful for in 2013....and I hope that 2014 is even better...for me and for all of you! Here's to a fabulous 2014! Hope you enjoy your visit.....do stay a while! All photos, unless credited, are taken by me. If you wish to use any of my photos, please email me. Simple theme. Theme images by Ollustrator. Powered by Blogger.